Getting around town on your favorite scooter is a great way to save on gas mileage while riding in style. Made to offer a compact ride without losing out on the fun or function, a Suzuki scooter makes a statement about the level of quality you expect as a rider. 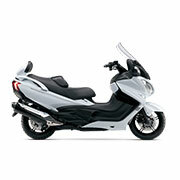 We are pleased to keep your favorite ride in great shape with our selection of Suzuki scooter parts at the ready. When looking at the history of the Suzuki scooter lineup, there are a few noteworthy facts worth considering. For starters, the brand Suzuki was already synonymous with high powered motorcycles long before they branched out to scooters in 1979. While the motorcycle was designed with speed as the main goal, the scooter focused more on added stability for a safer, slower ride. While the focus was on more stability than a motorcycle, that didn't mean Suzuki gave up on their penchant for power. In fact, they pioneered some of the most powerful engines for this vehicle type for the era such as their Skywave Burgman 400 in 1998 which featured a 250cc engine for some of the highest engine displacement for a scooter, as well as their updated Burgman 60 in 2002 which offered an even more powerful engine coupled with the riding ease of riding modes of automatic or manual based on riding conditions. Since then, this intrepid manufacturer has focused on not only creating powerful and compact scooters aimed at an easy, enjoyable ride, but also contributed to the creation of the some of the most environmentally friendly models on the market. In fact, their 2009 Burgman Fuel-cell scooter was hailed by industry experts and environmental agencies as an incredible advancement since its only emission during operation is water rather than harmful gas. This brand continued to introduce innovative and exciting models for the scooter fan. We are honored to play a part in your story with this brand with our selection of affordable Suzuki scooter parts. When shopping for Suzuki scooter parts, you need the right solution for the exact needs of your vehicle. In order to find the right part, you need a diverse selection at the ready! We offer an inventory of Suzuki scooter parts covering years from 1979 to their 2017 models. Since a scooter designed in one decade is usually different from a more current model, we know how important it is to have a range of years available. While years are important, finding the right part also requires the right model and individual model series. We offer a complete lineup of Suzuki models and series within the model to ensure you get the right solution for your needs. Whether shopping for your classic FA50 or one of the generations of the impeccable Burgman scooter, we have you covered. Best of all, these solutions are made specifically for your model and series to ensure a proper fit in terms of sizing, as well as optimal performance standards and longevity. In addition to offering a wide range of years, models, and series, we also offer a diverse selection of individual part types to cover every aspect of your scooter. We offer solutions for all the major areas such as carburetors, engine, fuel tank, and air intake, as well as solutions for areas such as the fender, frame, handlebar, seat, and more. Whether looking for solutions to fix your turn signal, an engine harness, or a wiring fix, we have you covered with high-quality solutions to get the job done so you can get back to riding. We offer OEM solutions which come straight from the manufacturer to ensure the best option for your ride. With our high-quality selection covering every imaginable component of your favorite set of wheels, its easier than ever to find what you need to get back to riding. Order today to make the most of your next ride! We are committed to outstanding customer service with every order. In addition to our large inventory of reliable solutions at great prices, we pride ourselves on our customer service. If you have any questions while shopping with us, please reach out for further assistance on the matter. Our staff is always happy to help.